I took birth in an exciting life of Krishna consciousness 43 years ago from the mother of Srila Prabhupada’s wonderful transcendental books: Krsna Book, Nectar of Devotion and Bhagavad-gita As It Is. That didn’t matter so much anyway, because I myself was too busy being loved, fed and fattened by my Mama. In that tender first year of my life, mother showered me with so much compassion, patience and care. I just can’t believe how she so slowly and personally taught me how to correctly think and desire, feel, love and act, not only for my own benefit, but interestingly enough for the benefit of everyone around me too. Believe it or not, after one year of being Mama’s wild, wining babe, I soon became a “fairly” good Krishna conscious kid. Then Papa finally came home. “How radiant, down-to-earth, warm and compassionate,” I thought as I gazed upon his beautiful, golden transcendental form with my clear and innocent baby eyes. 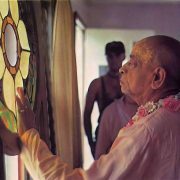 Srila Prabhupada’s transcendental book distribution ki jai! Jaya Jaya Sri Radhe!